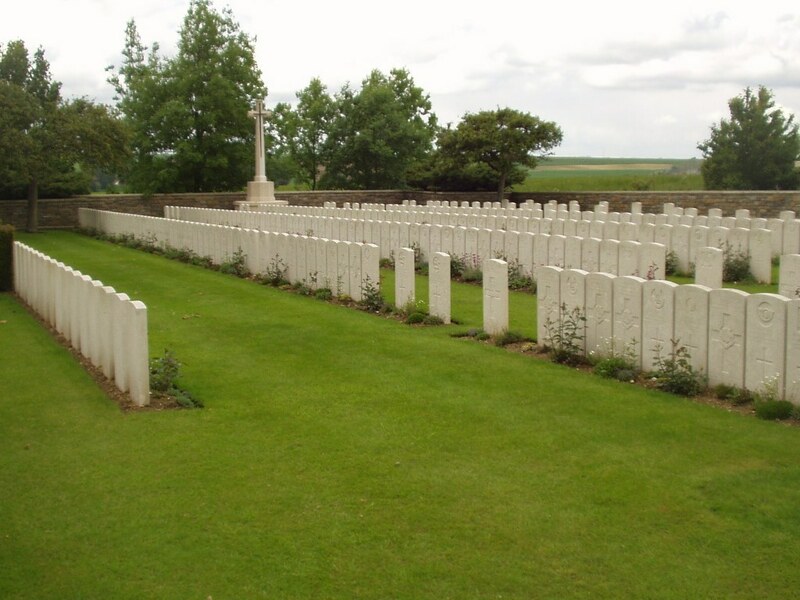 Cojeul British Cemetery - Click on the image to enlarge it. Use your back arrow to return to this page. Photograph by permission of the Commonwealth War Graves Commission. St. Martin-sur-Cojeul is a village about 8 kilometres to the south-east of Arras. Cojeul British Cemetery lies about 1 kilometre south of the village whichl was taken by the 30th Division on 9 April 1917, lost in March 1918, and retaken in the following August. Cojeul British Cemetery was begun by the 21st Division Burial Officer in April 1917, and used by fighting units until the following October. It was very severely damaged in later fighting. The cemetery contains 349 burials and commemorations of the First World War. 35 of the burials are unidentified and 31 graves destroyed by shell fire are represented by special memorials.